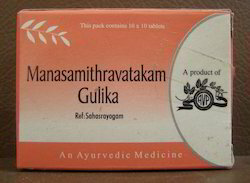 Our range of products include avp manasmithra vatakam gulika medicines and ayushakti painmukti m. j tablets. We are extremely engaged in providing a superior quality AVP Manasmithra Vatakam Gulika Medicines. Our offered medicines are processed at vendors’ end using the finest quality chemical compounds and sophisticated technology. In order to provide a qualitative grade, these medicines are rigorously tested on different parameters. The offered medicines are widely used in insanity, lunacy, alcoholism toxicity, loss of memory and convulsions. Moreover, these medicines are availed by our clients from us at affordable prices. Bala, Nagabala, Vilwa, Dhavanimoola, Vidruma. With the valuable assistance of our experienced team of professionals, we are offering a premium quality Ayushakti Painmukti M. J. Tablets. 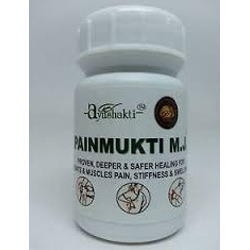 Useful for healing of joints and muscles pain, stiffness and swelling, offered tablets are processed using optimum quality chemical compounds and sophisticated technology at vendors’ end in accordance with industry norms. Apart from this, provided tablets are widely praised in the market for their long shelf life and effectiveness. Looking for Ayurvedic Brain Product ?